*note that ink is not included in the CISS cost; you can order CISS already filled with ink. What is CISS and How Does It Work? Continuous Ink Supply System (CISS) is an ideal alternative to original cartridges in inkjet printing. СISS consists of three parts: ink tanks with ink of each color, a silicone pipe, and cartridges with chips. Ink is constantly being added from ink tanks to the cartridges during the printing process and then it goes through the printing head to the paper. Usually the economy of using CISS is about 95%, so you save $950 for each $1000 you would spend on original cartridges. The tube is made of “A+” class silicone. Even if you make a straight angle (180 (0)), the tube will still supply ink into the cartridges with no risk of damage. Cartridges are made from the same materials as original ones. Chips are reset automatically. Original cartridges cannot be reset, but INKSYSTEM chips can be reset as many times as you need, up to millions of times. 1. Huge savings – up to 95%, compared to original cartridges! You can easily compare the cost of 100 ml high-quality INKSYSTEM ink (South Korea) with the cost of cartridge (standard – app. 8 ml, extended volume – 11 ml). Just compare 1 ml and count up the difference! INKSYSTEM СISS are made in modern factories. We have proved its high quality to tens of thousands of customers and hundreds of partners in different parts of the world, from Egypt to Europe and USA. A one-year warranty is provided for all INKSYSTEM products. The printer’s construction does not need to go through ANY changes. All you need to do is to remove original cartridges, install the CISS cartridges and set the tube into the printer. Usually this process takes 10 to 20 minutes and can easily be done at home. Otherwise you can use the FREE installation offer in the closest INKSYSTEM office. 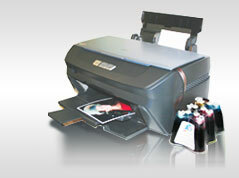 CISS is ideal for high-quality and inexpensive printing of color text and photos. Continuous Ink Supply System (СISS) can be applied to almost all inkjet printer models that have a built-in printing head because the operating life of the printing heads is almost unlimited. These requirements meet the majority of Epson and Canon inkjet printer models, and some HP and Brother models. At the office: pricelists, booklets, offers, schedules and diagram printing. A color copy of an А4-format page costs app. $0.01, whereas in the printing centers it costs app. $2-7. Professional printing: СISS with high-quality ink and ICC-profiles gives 95-97% quality, compared to original materials. The cost is 20 times less, so there is a chance to save a lot of money on printing! Refillable cartridges are made similar to original cartridges; however they have auto-resettable chips which allow adding ink into each cartridge again and again, up to several hundreds of times. These cartridges are easy to refill, there is no need to remove these cartridges from the printer. These cartridges are made of high-quality plastic, and can be changed in their positions which easily allows to alter them from one model to another or to replace any damaged cartridge. Dye based ink, or photo ink, is ink based on dyes that dissolve in water. They have a high quality color rendition of shades and a low price. “INKSYSTEM” ink is made in South Korea using the newest technologies. The unique formula of “INKSYSTEM” ink allows it to conform to the majority of Epson, Canon, HP, Brother models which are presented in the world. Excellent color rendition, together with the free ICC-profile on each photo paper type gives a bright and juicy image which is an excellent alternative to original materials. The printing head with “INKSYSTEM” ink does not dry up within 3 months when in an idle printer. Note that using cheap poor-quality ink often leads to printer head contamination and to printer failure. We recommend using quality ink. Remember, that mixture of different manufacturers’ inks can lead to printer failure. We recommend using ink of the same trade mark so that you can get a premium quality image and have an efficiently working printer. Unlike dye-based ink, a solid pigment (very small parts of solid particles) is used as a dye in pigment ink. This ink has higher water resistance and higher durability than liquid dyes; however the rendition of a semitone (shade) is worse and it has a higher cost. The pigments are colored solid particles that have the characteristics of a solid body, such as volume, diameter, etc. Pigments applied in the ink are reground to particle sizes less than 0.1 microns. Sublimation ink is used for printing on thermofilms (T-shirts, cups etc.). Sublimation ink provides a durable image that does not crack, exfoliate or blur for a long time. The technology of sublimation provides a bright photorealistic image. Ultra chrome ink is applied for maximum color rendition and to preserve the image, mostly it is in demand among professionals. All photo paper is protected by company logo at the back and has an increased level of whiteness; the quality is “A+” class. For some factors, such as sheet whiteness, “INKSYSTEM” photo paper exceeds the factors of “Epson” and “HP” photo paper. It is meant for returning the chips to zero (on specific printer models). It is used for printing head cleaning to remove dye based ink.